And I jumped in with both feet! I added another day to my work week right before the 4th of July holiday, bringing me back to a full-time schedule just in time for the onset of the summer madness. I’m so happy to be able to say I’m really “back” but the trade-off is that I need a lot more rest than before, in the old days before cancer. An aside — a few weeks ago I asked Dr. Pearl’s nurse (a rock if ever there was one) my burning question: what is this strange time called, this time after treatment, when life gets to/has to resume, when slow and steady recovery is the goal yet uncertainty seems to keep lurking in the corner? “It’s called remission,” she said. I waited until I got to the car to laugh and cry. So what do I do each day? Go to work. Work hard, almost as hard as I used to. Come home and climb the stairs (which have been reduced to something more like the Appalachians than Mt. Everest). Eat something. Put my feet up. Watch a little TV, catch up on phone calls, knit if I can concentrate. Read for a few minutes in bed, then turn off the light after the book smacks me in the face because I’ve dozed off. Rinse and repeat! I have no complaints — I’m so pleased that I’m able to do my whole job again, and I’m happy every single day that I can come home bone-tired for some reason other than illness. Knitting has taken a bit of a back seat, but I am almost finished with the second Hedgerow Mitt, which in this photo is only a few inches along. I would have finished it already, but I noticed that before the hand decreases I got a little carried away, and knit too many rounds. I need to frog back so this mitt will match its mate. I still haven’t figured out how to take a good photo of such a red yarn, but I’ll keep trying. We’ve been lucky with our weather lately, so lucky that until the past few days it’s felt more like April than July. Today has been another gorgeous day, and a good day to be able to stay home, recuperate from the week, and enjoy my pretty flowers (a nice surprise from my boss). By tomorrow morning I’ll feel rested and ready to take on the pile of things on my list! Yeah! Starting on your first cancer free year!!! The mitts are gorgeous, the yarn looks beautiful in the photo. Your attitude is amazing. And I know that feeling of getting hit in the face with the book as you nod off! Beautiful flowers! I have the most trouble photographing reds and purples. The mitts are lovely. It's good to see you making good progress. Thanks for your post. I have a relative who has been battling cancer and she has not said much about her experience — I suspect that your experience (the stairs = climbing mount everest) is similar to what she has been going through.I do love your Hedgerow mitts. 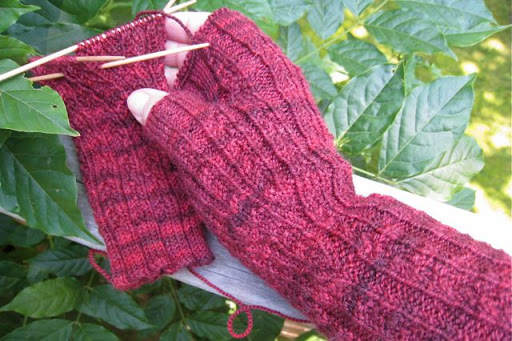 I have several single mitts, but have not yet managed to complete a pair, so I'm envious that you've gotten that far. They are gorgeous! I find it glorious that your days continue to evolve and trend ever closer to whatever it is we imagine "normalcy" to be. Keep rinsing and repeating, dear Jane! The joy in just living another day is unspeakable sometimes. Hope the people are treating you kindly, you know how they get! Sorry I missed you a few weeks back, hope to see you soon. Oh Jane, they have to call it remission because they think in terms of people being sick. Well people do not come to see them. It's a very sad perspective.As for needing more rest than before … ahem … you needed more rest before you got sick, you just didn't allow yourself to rest then. Glad you're WELL, and back at work, and knitting, too. Bravo! I salute you. Beautiful flowers! Glad you are well. Isn't it wonderful when normal life is so sweet? Enjoy swimming! 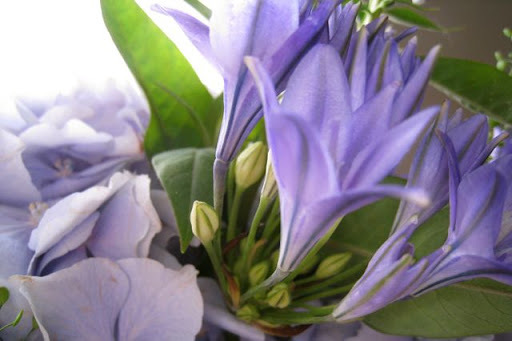 Beautiful pictures of those flowers, I can almost smell them. I've said it before, and I'll say it again:Jane! Jane! Jane! Jane! Jane! Jane! Jane! Jane! Jane! Hope this doesn't sound too corny, but your beautiful post reminds me of something a friend sent me once: Yesterday's History, Tomorrow's a Mystery, Today is a Gift…that's why they call it The Present. Enjoy scores and scores of Presents!! 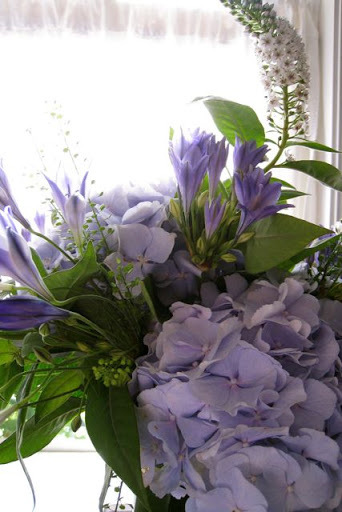 Jane- Happy to see your post, your gorgeous purple flowers, and your Hedgerow mitts. Hang in there, look back and see how far you have come! The pictures and the Hedgerows and the uplifting words – thanks, I needed that! Yay for you! Dear Jane, I am new in spotblog, I found "random" your blog and vibes it gives me are positive, positive. I will follow your posts. Have a nice sunday. Italo. Dear Jane,Keep swimming, and most important of all, keep your head above water. You continue to be an inspiration to me. They need to find another word for the space you are in right now instead of remission. Love the hedgerows! I need to try them. Right now I have two halves of a scarf that need kitchener stitching together. Wish me luck as this will be my first go at this grafting stitch! ;)Take care, Jane. Jane, thinking of you and hoping that you're gaining strength with each passing day. Those Amy mitts are so lovely. Why oh why didn't I join the KAL? duh.. Many blessings on your remission. Amazing what it takes to realized that being able to go to work is a true blessing. You are an inspiration to us all.Mitts are looking good!! !